GExperts is a free productivity enhancing tool which allows you to backup your project, browse classes, clean directories, store code in a Code Librarian, convert visual components on a form into code, an experts editor, an experts manager, grep search, IDE shortcut menu, replace components, and a tab order manager. Check out a full review of GExperts by Paolo Rossi. Head over and download GExperts. Castalia is an IDE enhancement which allows to to write better code, understand your code more completely, and improve the code you already have. I had never used Castalia before but Embarcadero just made it available for free with Delphi XE7 so I installed it. It comes with a productivity enhancing code navigation toolbar, code templates, smart automatic code refactoring, code metrics, enhanced syntax highlighting, project statistics, and even a code analysis tool which I found really interesting. The code analysis tool basically tells you which methods are rats nests that should be cleaned up. Check out the tour on the Castalia website. Or if you own Delphi XE7 you can download it free right here. Delphi Dev. Shell Tools is an enhancement for Windows Explorer that brings a bunch of productivity enhancing functionality to the right click menu of Explorer. You can pick which version of Delphi to open a project with, you can compile a project directly with MSBuild, you can calculate checksums, and it comes with all kinds of clipboard enhancing right click options. We have a blog post with more information here. 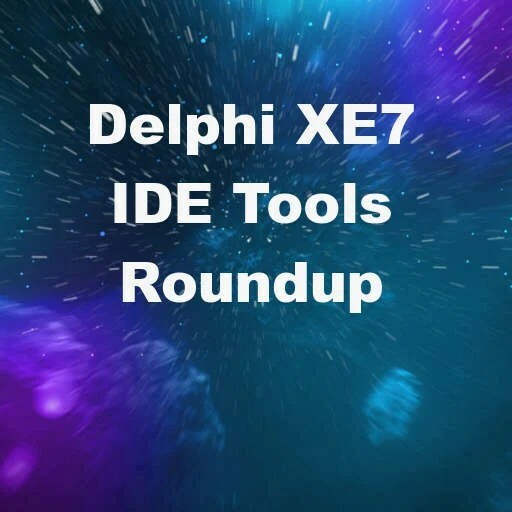 Head over and download Delphi Dev Shell Tools free. The IDE Fix Pack is an unbelievable awesome Delphi XE7 IDE enhancement. What it does is make tweaks in memory to the Delphi IDE which corrects some issues and increases the speed of the IDE dramatically. I’ve seen a couple different users report that their project compile time dropped from around 15 minutes to 1:30 minutes after installing the IDE Fix Pack. We’ve covered the IDE Fix Pack here, here, and here. Head over and download the free IDE Fix Pack. ModelMaker enhances productivity, helps with refactoring, and provides a UML-style CASE tool. It has things like instant code generation, code import, design pattern deployment, and documenting your source in help files with one click. It lists Class Diagrams, Package Diagrams, Implementation Diagrams, Use Case Diagrams, Robustness Analysis Diagrams, and many more UML diagrams. It is a commercial tool but the amount of features packed into it are amazing. Head over and download the ModelMaker free trial. CnPack is a huge Delphi XE7 IDE enhancement with many many features. It adds toolbars in various places to increase productivity. It has enhanced syntax highlighting, converting text to Object Pascal strings, an eval swap tool, a uses and include toggle tool, a var field toggle, jump to interface and keywords, a message box designer, file replacer, tab orders tool (including auto update), source code templates, prefix wizards, property corrector, units used list, project backup, project cleanup, historical snapshot file, procedures list, uses cleaner, and many many more. Truely an epic Delphi XE7 IDE enhancement. Did I mention it is free as well? Paolo Rossi has a very extensive review of CnPack. Head over and download the possibly unstable version of CnPack with XE7 support. Continua CI is a continuous integration server with a web UI which removes the hassle of running builds by checking for changes in your source and runs builds automatically. It allows you to manage multiple builds very easily and comes with an advanced workflow editor. It integrates with FinalBuilder and MSBuild plus it will run builds in parallel. It can spread out builds across multiple machines on your network to speed up the process. The latest version supports Delphi XE7. Head over and check out the video before downloading the Continua CI trial. The Delphi IDE Theme Editor is a free tool which allows you to customize the colors of the code editor of the Delphi XE7 and Appmethod IDEs. You can do things like change the font, set the background of the code editor, and basically customize the syntax highlighting colors easily. It also comes with a Delphi IDE Colorizer which lets you customize the look and feel of the workspace. It has things like support for VCL styles, support for GExperts, CnPack, transparent menus, and over 80 different themes. We covered the the IDE theme editor here as well but now it supports Delphi XE7. Head over and download the Delphi IDE Theme Editor for free. INSTANT BONUS: Check out the Delphi Package Installer which resolves dependencies between packages, compiles, installs, and adds source paths to the IDE. What other Delphi XE7 IDE add ons am I missing? Post in the comments your favorite IDE add ons. Great round-up. I would recommend CnPack with reservations. It’s awesome for VCL work, but very limited if doing Firemonkey work. Delphi Unit Dependency Scanner (http://www.easy-ip.net/delphi.html) – While not an add-on, still quite handy!